When we consider the possibility of mechanical problems on our Infiniti car, we usually think of the parts under the hood. However, there are a number of other aspects that contribute to the driveability of our vehicle. The suspension of our Infiniti car is what allows us to have a smooth, comfortable ride, and if our rear suspension is compromised, it can dramatically impact the way it feels to ride or drive. Knowing how the suspension works in your Infiniti car is the first step to avoiding possible issues in the future. However, also being able to recognize the warning signs and what to look for when the rear suspension coil springs begin to wear out or even break will help to avoid expensive fixes down the road. Why are the Rear Coil Springs Important? The coil springs, or compression springs, are an imperative part of your vehicle’s suspension system. They work similarly to shocks and are specifically designed to help your car absorb slight impacts caused by bumps, potholes, or uneven roads. It is also in place to keep your vehicle at a specific height above the road. Since the coil springs are under the severe pressure of the vehicle’s weight, it can wear out over time and become weakened from too much weight as well as corrode from exposure to certain roadway substances. You will likely be aware that there is something amiss with your suspension long before the springs completely fail. Knowing the usual signs can be helpful in avoiding further mechanical damage to your car and to keep the driver and passengers safe. If you notice any of the issues listed below, be sure to address the problem immediately and consult a trusted mechanic for thorough advice and guidance. Some newer Infiniti models are equipped with a warning light on the gauge cluster in regards to the traction system. The sensors in the suspension will be able to detect when the vehicle stability is abnormal. If this light illuminates, it may not mean the coil springs need to be replaced, as a number of other traction system issues could instead be the cause. Since the rear coil springs are a part of the suspension system to absorb the bounce that comes with driving over bumps, if the springs are failing, they will not be able to properly absorb the full vehicle weight. This will be especially noticeable if you are driving on rough roads. You will likely experience excessive bouncing and shaking if the coil springs are compromised. Usually, one coil will be more worn out than the other and cause the vehicle to sag in one back corner. This will be especially obvious from outside the vehicle, but you may also notice some instability while driving. The coil springs help to keep your vehicle wheels balanced while driving which when in good condition will allow the tires to wear down at the same pace. If you notice certain tires wearing down excessively on either the inside or the outside, it could be due to a failing rear coil spring. You may also notice shakiness or wheel vibrations when driving at higher speeds. If you notice your vehicle bottoming out frequently when going over dips in the road, it could be due to suspension coil failure. When the coils get worn out they are unable to support the vehicle and fully absorb the impact of bumps and dips in the road. When the coil spring is weakened, the entire suspension system is also much weaker. This can cause rattling coming from the rear suspension when driving at higher speeds or on rough roads. 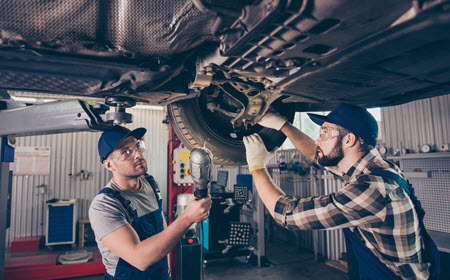 become less comfortable to drive or seems to ride bumpier than usual, it is best to get the suspension system inspected before more damage can be caused. The rear coil springs can have a big impact on the entire suspension system, and if they are worn down completely, both sides of that axel will need to be replaced. If left for too long, it can cause damage to other vehicle parts including the tires and undercarriage. If you live in or around Phoenix, Paradise Valley, McCormick Ranch, or Scottsdale, AZ, consider Tech Plus Automotive for any questions you have regarding your suspension system on your Infiniti car.